The prospect of Jair Bolsonaro putting an end to the demarcation of any new indigenous areas in Brazil would halt 129 processes that are currently ongoing. 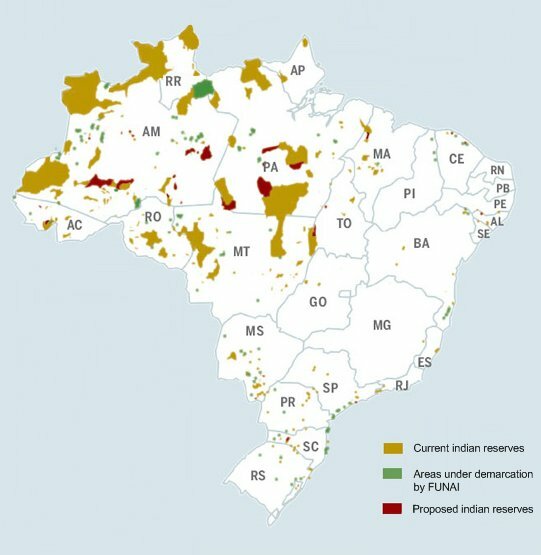 In addition to the threat posed to new demarcations, Bolsonaro’s proposals also pose a risk to lands already recognized, which could be made available for infrastructure projects such as hydroelectric, roads and mining activities. Stated by Bolsonaro during his campaign for Brazil’s presidency, his recent election represents a risk of these prospects concretizing in the next four years of his mandate. While the 129 ongoing processes of demarcation of indigenous lands account for 11.3 million of hectares and are home to around 120,000 indigenous people, the 436 previously recognized indigenous lands being made available for infrastructure process would threaten the 117 million hectares they account for. According to the Socio Environmental Institute (ISA), at least 40 infrastructure projects such as the hydroelectric of Tapajós would cut through indigenous lands if concretized. While Bolsonaro’s plan of government has failed to mention indigenous peoples and the process of demarcation of lands, the recently elected president has several times made his position on the matter clear by criticizing what he has called the “industry of demarcation of indigenous lands” and by stating that, if elected, no land would be demarcated for indigenous reserves. In spite of Bolsonaro’s statements, the demarcation of new lands is a power held exclusively by the Executive, which in Brazil accounts for the President, the Vice President and the Ministries. The power to give continuance to the process falls to the Ministry of Justice, to which the National Indigenous Foundation (Funai) is linked. In regards to the lands already demarcated, the law prohibits any projects that might have a direct impact on indigenous lands. Moreover, Article 231 of the Constitution states that indigenous people have original rights over the lands they occupy and that it is the Union’s competency to demarcate them. To change this, amendments to the Constitution would be required. While the Federal Public Ministry has stated that it will oppose Bolsonaro if he interrupts the processes of demarcation of new lands, the productive sector has tried for years to change Article 231 to allow the exploitation of indigenous lands. Although it is also referred to the participation of the communities, Bolsonaro’s proposal to hinder the demarcation of new lands has the support of associations such as the Brazilian Association of Soy Producers (Aprosoja). Photo courtesy of Wikipedia Commons, 2008 data.